Corri Garza: Terrific Tuesday Challenge - Things That Go! Terrific Tuesday Challenge - Things That Go! Hi everyone! I hope you all had a great weekend. How do you like my new blog design? I've been wanting to update it for a while now. K. Davidson Blog Design decorated it for me and I just love the result. It's time for a new Terrific Tuesday Challenge over at Scrappy Moms Stamps! The challenge this week is Things that Go! I used a sentiment from the newly released set...Ready, Set, Go! For my card I used the new "That's My Boy" Collection from Echo Park. 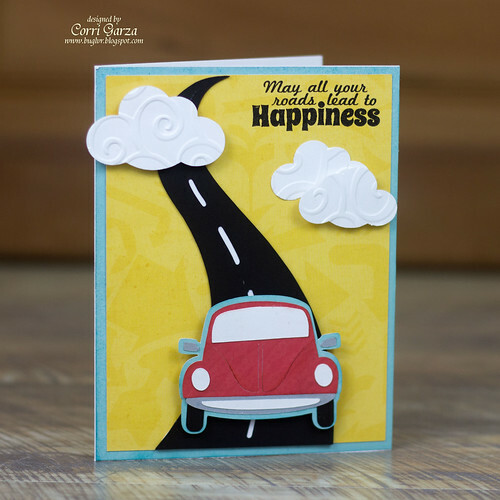 I found the road die cut and the cute little car in the Silhouette Store and I used my Fiskars cloud punch for the clouds. 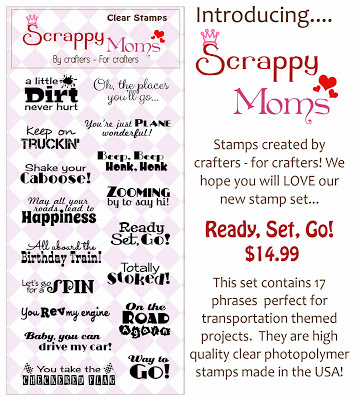 Head on over to Scrappy Moms Stamps to play along with our challenge for a chance to win a set of stamps! very cute Corri! I used to own one of those cars! I loved my Herbie as we referred to it! Your new blog design is lovely and your card is just adorable, I love the clouds! Cori, I love your new design. Beautiful! Totally cute!! Loving the New blog LOOK!! !